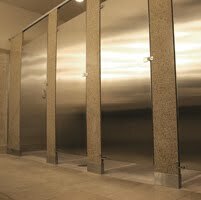 1) What colors are available for the Stainless Steel Textured Partitions? None. The natural silver color of the stainless steel is beautiful and can be easily matched with any interior bathroom color or décor. 2) Which mounting option for the Stainless Steel Textured Partitions is most appropriate for easy cleaning of the floor? The most appropriate mounting option for complete floor access is the ceiling hung method. The partition does not touch the floor. 3) What type of steel is used to construct the partitions and doors of the Stainless Steel Textured Partitions? The partitions and doors are built from standard 22 gauge stainless steel. 1) Why is granite used as a building material for Fusion Partitions? Granite is used as a building material for Fusion Partitions because of its many qualities such as hardness, beauty, and scratch, stain, and mold resistance. 2) Will the stainless steel rust in the Fusion Partitions? Under normal use and care, stainless steel will not rust. It can be damaged by use of harsh chemicals, harsh cleaners, or steel wool. 3) Why is the overhead braced mounting method so common for Fusion Partitions? The overhead braced mounting method is common used with Fusion Partitions because it offers an excellent balance of price, strength, and ease of installation.